At this time of year, when the weather turns cold, I like to bake cakes with a bit of spice to warm us up. 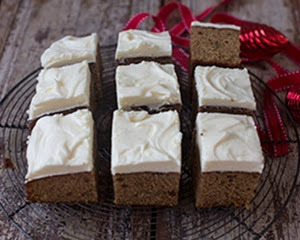 This ginger tray bake with cream cheese frosting has pieces of crystallised ginger throughout, to add a bit of texture and extra flavour. 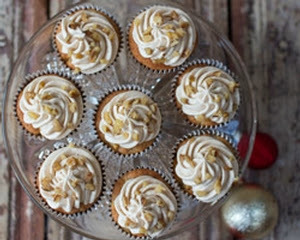 The spiced apple cupcakes are lovely and moist and were a big hit with my children, especially when still warm from the oven, before I could even decorate them. I developed both recipes for the Good Food Channel website, where they can be found in full.